Temperature Range: Ambient to 900C. This is Double walled unit Inside made of thick S.S. sheet and Outside M.S. Powder coated , Supplied complete with shaking tray, water bath cover to work on 220 volt 50 Hz A.C. supply. These Water bath Shakers have wide applications in Biotechnology, Micro-Biology, Chemistry, Quality Control and other life sciences laboratories. 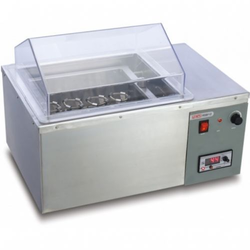 Water bath incubator shaker is of sturdy construction with outer body made of mild steel sheet duly powder coated and inner chamber made of stainless steel grade 304. - Inside SS/Outside MS Powder Coated. 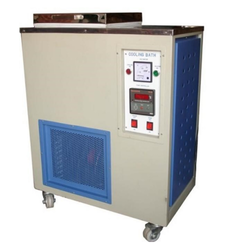 - Suitable for Washing Fastness blend composition and lab dip test with digital temp. indicator/Control, timer & RPM counter. Minimum Noise and Vibration is ensured by Specially-designed shaking mechanism. Lid: Stainless Steel Pyramid Lid.